Our network has a wired Xbox connecting through an OpenWRT router and out to the interwebs. For those running the firmware which came with your modems, you should be able to follow the instructions here – I have not used these guide so, check first and proceed with caution. Before you get too carried away fixing a problem which may not be there, first check out the current Xbox Live status here. Determine the Xbox MAC address. Set a static IP address on the Xbox. 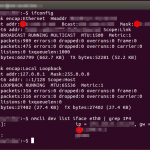 Configure a Static IP lease on the router. Create the port forward rule(s). Grab a laptop and turn on the Xbox. You’ll need to switch between both during this HOWTO. If you are unsure of your network settings, you may want to grab them before you carry on. From the long list of text that appears (you may need to scroll up the window a little) you will see the network connections and their values. For Windows it will look something like (Fig 1. ), for Linux it will look something like (Fig 2.). The settings you are interested in are the IP Address ?, the Subnet Mask ?, the Default Gateway ?, and your DNS Server ?. 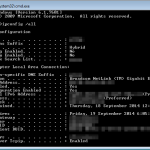 This may be as easy as looking in your routers DHCP table, or you may need to delve into the menus on the XBOX. If you can see the XBox leased here, then great! You can skip to the ‘Set a static IP address on the Xbox’ step. Note down the MAC address. We will be using this to setup a static IP lease in the router. You may want to plug a USB keyboard into your Xbox for the next bit, the onscreen keyboard + controller navigation is a little… painful. You will also want to choose an IP address that is not the same as the one you discovered in the Find your Network Settings section above. 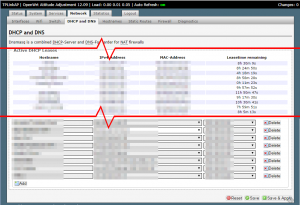 Select ‘Gateway’ > [Enter your Gateway IP Address (?)] > Click ‘Done’. Select ‘DNS Settings’ > ‘Manual’ > ‘Primary DNS Server’ > [Enter your DNS Server Address (?)] > Click ‘Done’. ‘Secondary DNS Server’ > [You can enter your ISP DNS Server Address, or the Google DNS Server Address, or the OpenDNS Servers] > Click ‘Done’. Scroll to the ‘Static Leases’ section at the bottom of the page (Fig. 4). in ‘IP address’, click ‘–custom–‘ and enter the same IP address you set manually on the Xbox. This may seem like double up, and it is, but the reason we are setting a static IP address both on the Xbox and in the router is this. If an update to the Xbox resets the network connection information (or your kids are ‘trouble’ shooting) you will still want the same IP address assigned (this time via the router), otherwise the port forwarding rule(s) we are about to create will not work. Switch back to the Xbox and run a test connection. All things being equal, you should connect to the Xbox live service. If not, you may need to repeat the port forward step adding the following ports (one at a time, in order, testing after applying each forwarding rule).